Many of our clients request a motion floor - two pigments blended together to create some natural movement in the flooring. More often than not this is used to imitate the finish of polished concrete, in various shades of grey. However, occasionally we are asked to produce a bespoke motion floor, in alternative colours - and our hand-applied finish allows control over how extreme this motion effect can be. 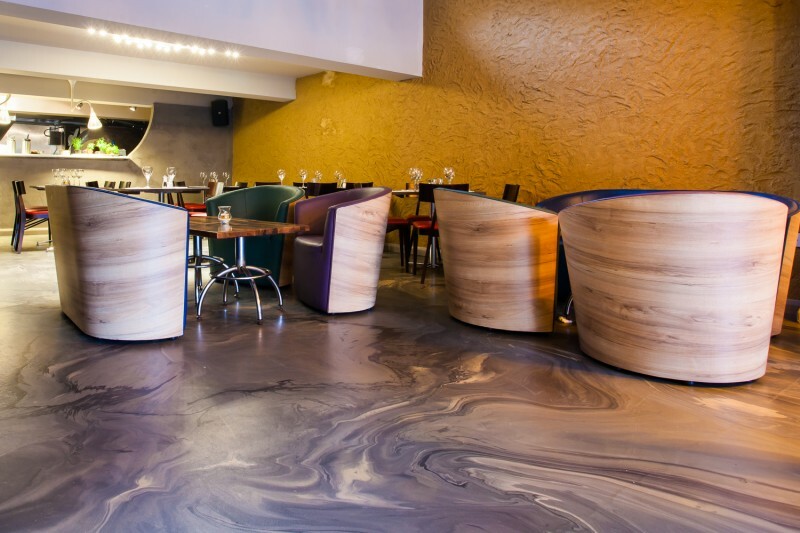 At Zero Degrees we created a bespoke motion floor with specific pigments and an extreme variation of colour, resulting in this dynamic floor finish that creates an immediate impact. This bespoke colour was obviously used with our ToughSphere system to create the anti-grip slip-resistant finish that's perfect for hospitality environments. This beautiful bespoke floor is truly unique - immediately striking and perfectly reflected in the smooth geometry of the furniture. We love the monochrome colour palette but it's the birds eye shot that really shows it off in all its glory - a true piece of art!